The Earth was formed 4.5 × 109 years ago by accretion within the cloud of dust and gases left over from the formation of the Sun. Its main ingredients were iron and silicates, with smaller quantities of many other elements, some of them radioactive. Energy released by radioactive decay (mostly of uranium, thorium, and potassium) heated the planet to high enough temperatures to melt some of the constituents. The iron melted before the silicates, and, being denser, sank toward the centre of the aggregate, where it accumulated to form our liquid iron core. Fig. 3. 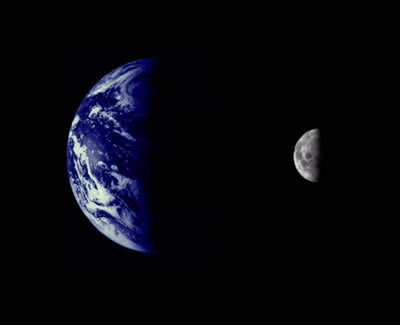 The Earth and Moon. Two images made by the Mariner 10 spacecraft in 1973 from 2.6 million km distance. These images have been combined to illustrate the relative sizes (but not the relative distances) of the two bodies. Credits: NASA/JPL/Northwestern University (image code PIA02441.tif from http://visibleearth.nasa.gov/). At the time the Earth formed, other planets were also being formed, of course. These eventually became our present-day neighbours in the solar system. But in addition, another planetary body formed in the same orbit as the young Earth. It was roughly the size of present-day Mars (a third or half the size of Earth), is sometimes called Theia, and it hit the Earth late in Earth’s growth process. Heat energy of the impact melted the two planets; the iron Theia contained slurped into the Earth’s liquid iron core, and rocky debris from the impact exploded into orbit around the Earth and gradually aggregated into our Moon (Fig. 3). Around the molten iron core (now itself the size of present-day Mars) a thin but stable crust of solid rock formed as Earth cooled. Water, rising from the interior of the planet through volcanoes and fissures and arriving from space through comet impacts collected in natural depressions in the crust to form the oceans. And that highlights another important point: the Earth is comfortably located in what astronomers have called the ‘Goldilocks orbit’, which is at just the right distance from the Sun to be in a temperature range in which water can exist as a liquid (Goldilocks because in the fairy-tale Goldilocks found a breakfast that was ‘just right, not too hot and not too cold’). Astronomers are simple, gentle, people; but we would recommend that you read Andy Gardner’s paper about the anthropic principle (essentially that life must be possible for there to be a living entity to observe it) and cosmological natural selection (Gardner, 2014).